, a learned Italian antiquary, and one of the most voluminous writers of his age and country, was born at Vignola in the duchy of Modena, Oct. 21, 1672. He was educated at Modena, and his inclination leading him to the church, as a profession, he went through the regular courses of philosophy and divinity, but without neglecting polite literature, to which he | was early attached. Bacchiiri recommended the ecclesiastical writers to his attention, and he at length became so devoted to general reading, as to pay little attention to his destined profession. 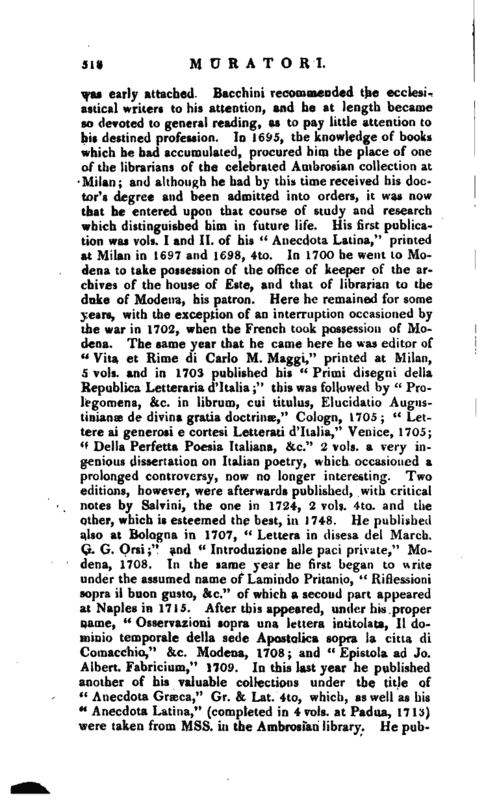 In 1695, the knowledge of books which he had accumulated, procured him the place of one of the librarians of the celebrated Ambrosian collection at Milan; and although he had by this time received his doctor’s degree and been admitted into orders, it was now that he entered upon that course of study and research which distinguished him in future life. His first publication was vols. I and II. of his “Anecdota Latina,” printed at Milan in 1697 and 1698, 4to. In 1700 he went to Modena to take possession of the office of keeper of the archives of the house of Este, and that of librarian to the duke of Modena, his patron. Here he remained for some years, with the exception of an interruption occasioned by the war in 1702, when the French took possession of Modena. The same year that he came here he was editor of “Vita et Rime di Carlo M. Maggi,” printed at Milan, 5 vols. and in 1703 published his “Primi disegni della Republica Letteraria d’ltalia;” this was followed by “Prolegomena, &c. in librum, cui titulus, Elucidatio Augustiniange de divina gratia doctrinae,” Cologn, 1705; “Lettere ai generosi e cortesi Letterati d’ltalia,” Venice, 1705; “Delia Perfetta Poesia Italiana, &c.” 2 vols. 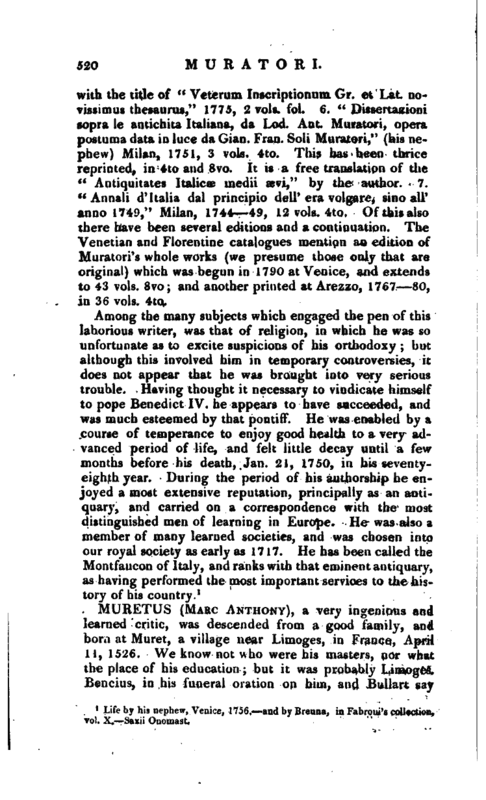 a very ingenious dissertation on Italian poetry, which occasioned a prolonged controversy, now no longer interesting. Two editions, however, were afterwards published, with critical notes by Salvini, the one in 1724, 2 vols. 4to. and the other, which is esteemed the best, in 1748. He published also at Bologna in 1707, “Lettera in disesa del March. G. G. Orsi;” and “Introduzione alle paci private,” Modena, 1708. In the same year he first began to write tinder the assumed name of Lamindo Pritanio, “Riflessioni SDpra il buon gusto, &c.” of which a second part appeared at Naples in 1715. After this appeared, under his proper name, “Osservazioni sopra una lettera intitolata, II dominio temporale della sede Apostolica sopra la citta di Comacchio,” &c. Modena, 1708; and “Epistola ad Jo. Albert. Fabricium,” 1709. In this last year he published another of his valuable collections under the title of “Anecdota Grseca,” Gr. & Lat. 4to, which, as well as his “Anecdota Latina,” (completed in 4 vols. at Padua, 1713) were taken from Mss. in the Ambrosian library. He | published also before 1715 some other works of lesser value, which, however, showed how intense his labours were, for he had accepted of some preferments in the church, the duties of which he performed with great assiduity, and wai particularly distinguished for his humane care of the poor, who indeed shared the greater part of the profits of his benefices, and the rest went to the repairs or furniture of the churches under his care. In 1715 and 1716 he visited various libraries in Italy, in order to collect materials for a history of the house of Este, and that of Brunswick which arose from it. 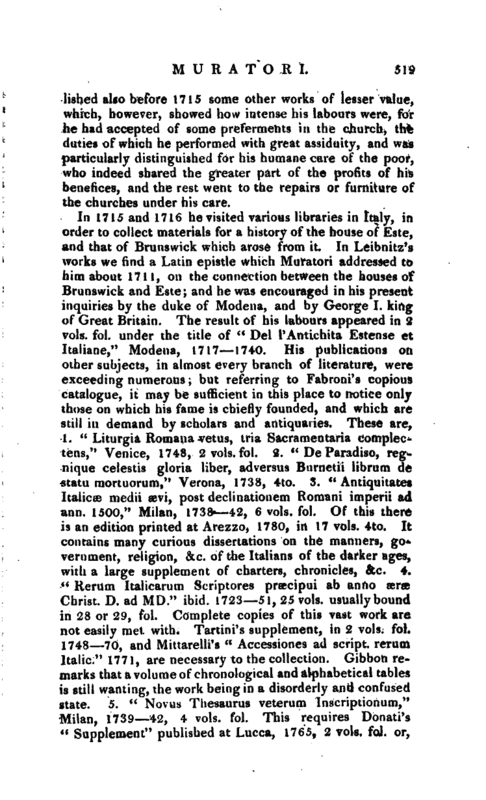 In Leibnitz’s works we find a Latin epistle which Muratori addressed to him about 1711, on the connection between the houses of Brunswick and Este; and. he was encouraged in his present inquiries by the duke of Modena, and by George I. king of Great Britain. The result of his labours appeared in 2 vols. fol. under the title of “Del I’Antichita Estense et Italiane,” Modena, 1717 1740. 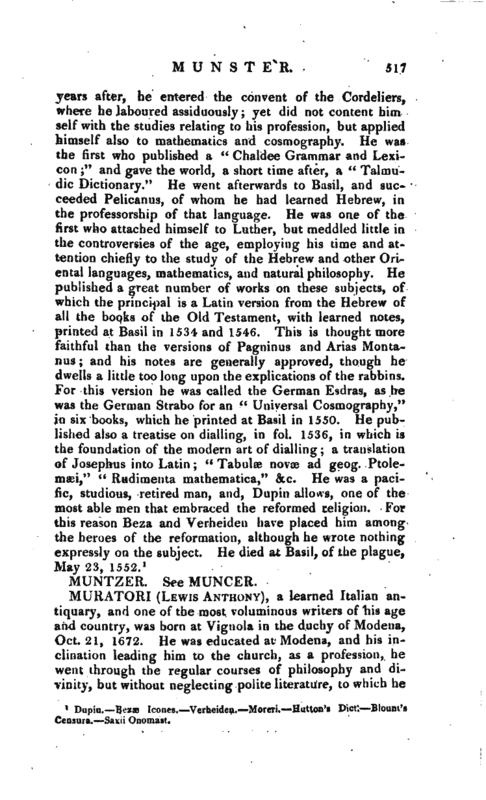 His publications on other subjects, in almost every branch of literature, were exceeding numerous; but referring to Fabroni’s copious catalogue, it may be sufficient in this place to notice only those on which his fame is chiefly founded, and which are still in demand by scholars and antiquaries. These are, 1. “Liturgia Romana vetus, tria Sacrarnentaria compiectens,” Venice, 1748, 2 vois. fol. 2. “De Paradise, regnique celestis gloria liber, ad versus Burnetii librum de statu mortuorum,” Verona, 1738, 4to. 3. “Antiquitates Italicae medii aevi, post declinationem Romani imperii ad ann. 1500,” Milan, 1738—42, 6 vols. fol. Of this there is an edition printed at Arezzo, 1780, in 17 vols. 4to. It contains many curious dissertations on the manners, government, religion, &c. of the Italians of the darker ages, with a large supplement of charters, chronicles, &c. 4. “Rerum Italicarum Scriptores prsecipui ab anno aerae Christ. D. ad MD.” ibid. 1723 51, 25 vols. usually bound in 28 or 29, fol. Complete copies of this vast work are not easily met with. Tartini’s supplement, in 2 vols. fol. 1748 70, and Mittarelli’s “Accessiones ad script, rerum Italic.” 1771, are necessary to the collection. Gibbon remarks that a volume of chronological and alphabetical tables is still wanting, the work being in a disorderly and confused state. 5. “Novus Thesaurus veterum Inscriptionum,” Milan, 1739 42, 4 vols. fol. This requires Donati’s “Supplement” published at Lucca, 1765, 2 vols. fol. or, | with the title of “Veterum Inscriptionum Gr. et Lat. novissimus thesaurus,” 1775, 2 vols. fol. 6. “Dissertazioni sopra le antichita Italiana, da Lod. Ant. Muratori, opera postuma data in luce da Gian. Fran. Soli Muratori,” (his nephew) Milan, 1751, 3 vols. 4to. This has been thrice reprinted, in 4to and 8vo. It is a free translation of the “Antiquitates Italicae medii aevi,” by the author. 7. “Annali d‘ Italia dal principio dell’ era volgare, sino all' anno 1749,” Milan, 1744 49, 12vols.-4to. Of this also there have been several editions and a continuation. The Venetian and Florentine catalogues mention an edition of Muratori’s whole works (we presume those only that are original) which was begun in 1790 at Venice, and extends to 43 vols. 8vo; and another printed at Arezzo, 1767 80, in 36 vols. 4to. 1 Life by his nephew, Venice, 1756. and by Breuna, in Fabroui’s collection, vol. X. —Saxii Onomast.